Saturday's event in Merriweather Park offers new creative potential to artists who already think outside the figurative box. 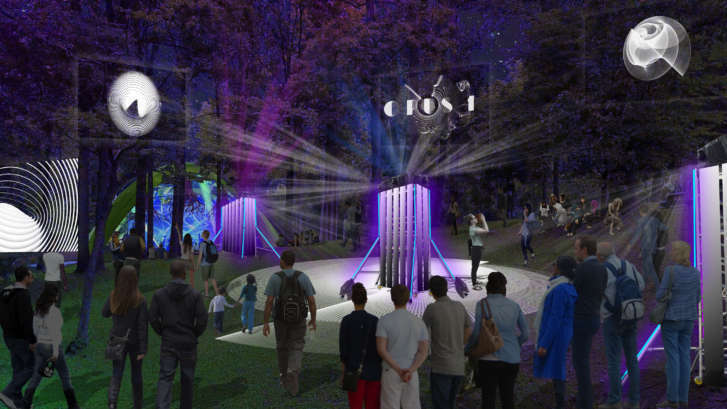 WASHINGTON — The woods of downtown Columbia, Maryland, will serve as a living, organic canvas Saturday for OPUS 1, an interactive art installation featuring an eclectic mix of sight and sound. Merriweather Park at Symphony Woods will host the inaugural one-day festival, which comprises 11 large installations. The tree-filled space around Merriweather Post Pavilion offers new creative potential to artists who already think outside the figurative box, said Ken Farmer of Wild Dogs International, OPUS 1’s curator and producer. And for the viewer, the festival offers an opportunity to break free of those glowing rectangles that frame an ever-growing part of modern life. Another advantage of this unconventional pop-up gallery in the forest: an installation’s interaction not only with the viewer, but also with other installations nearby. “I think what this site allows is something — I keep using this word — ‘journey,’ where you’re moving between works, but there is a level of voyeurism and sort of overlap or interconnection between the different installations,” Farmer said. Such a one-of-a-kind cultural experience is a good match for Columbia, which itself has aimed to embody the best of both city and suburban living. OPUS 1 exemplifies how the 50-year-old community is growing its cultural offerings amid a reboot. Vanessa Rodriguez, director of marketing for Howard Hughes Corp., said she wants to help bring arts and culture to a new level. “While we have the storied Merriweather Post Pavilion, and it’s such a beautiful setting, I really wanted to take it and work with Ken on bringing a different side to that and re-imagine what else this area can be used for,” Rodriguez said. OPUS 1 runs from 4 to 11 p.m. Saturday. Admission is free, but organizers encourage reserving tickets online.